We’ve all been there: while grocery shopping, we promise ourselves we will eat more fresh fruits and so we stock up. But, then we get home, get distracted, life gets in the way and before we know it, by the time we get around to eating it, it’s gone bad. The USDA recommends about 1 1/2 – 2 cups of fruit each day for most age groups*. But, it’s hard to reach that goal when your fruit winds up in the trash. Sure, there are healthy, high-fiber, whole-food based energy bars, crackers, and chips with a much longer shelf-life than fruit and make great on-the-go ‘emergency snacks’ out there, but these should never replace fresh fruit in your diet. Fruit is full of important vitamins, minerals, and fiber and when consumed as part of a healthy diet, can assist with weight loss and maintenance. You do the math: one serving of fruit like a medium-sized (2.5″ diagonal / 100g) peach, has just 38 calories. Compare that to a Kid Clif Z Crispy Rice Chocolate bar, which has 110 calories, 9g of added sugars, and provides zero servings of fruit. 1. Buy It Fresh, In-season and Often. Fruit tastes best when it’s picked fresh and eaten soon after being picked. This is why farmer’s markets often have the most delicious fruit. The fruit is grown locally so it can stay on the plants longer before being picked and sold. In contrast, fruit sold in grocery stores often travels a great distance so in order to stay fresh it must be picked before it is completely ripe, negatively affecting the taste (not to mention, the environment!). Buying fruits in season will give the opportunity to try different varieties that you may not find at the grocery store. Here is a list of in-season fruits when a farmer’s market is not available. 2. Store your Fruit Properly. Different fruits will keep best when stored in different ways. Tomatoes often lose flavor in the refrigerator, so keep them on the counter, spread out from one another. 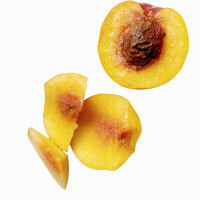 Grapes will taste wonderful cooled in your refrigerator, but your peaches and nectarines are most flavorful at room temperature. 3. Keep it Front and Center: Make fruit visible and accessible. Move fruit to the front shelves in your refrigerator rather than hidden in a drawer and store in clear containers. Take the time to wash grapes or cut up melons like cantaloupe, honeydew, and watermelon and put in an easily accessible bowl so they are ready to be eaten as soon as you get hungry for a snack. Or pre-slice apples and sprinkle with lemon or lime juice to keep from browning. For fruits that are kept at room-temperature, arrange in a bowl and leave front and center on your kitchen counter.